Are you considering an x86 server for a new business-critical application, or are you thinking of migrating an existing Unix RISC application to x86? x86 systems and CPU technology have evolved rapidly over the last several years and this platform is now capable of running workloads previously associated with larger proprietary UNIX systems. In addition, both Windows and Linux, the principal operating environments for these servers, have matured to the point where the combination of x86 server and these OS' can handle workloads associated with the largest UNIX systems from as little as three years ago. 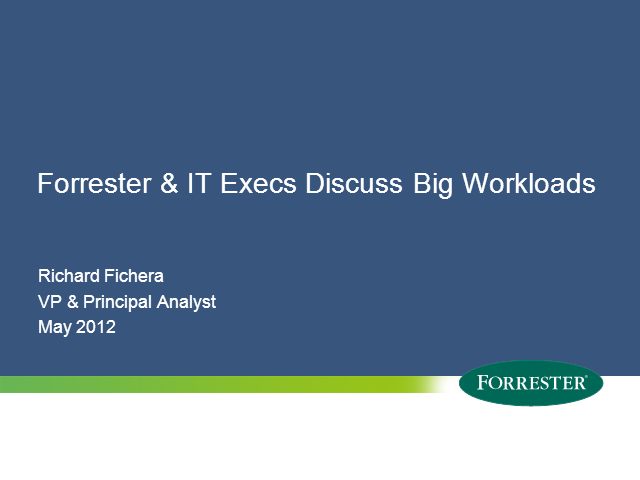 Tune into this live webcast with our guest Forrester analyst Richard Fichera as he speaks to the underlying trends driving modern infrastructure, when to consider moving from Unix to Windows or Linux changing principal operating environments, what to look for in an x86 platform and porting guidance. Rich will be joined by two IT executives who will share their business challenges, their decision-making process, and the business benefits they have achieved with their chosen database server solution, followed by a live Q & A. Maybe you sold Data Protector in the past...maybe not. Every one of your customers have the need....and the HP Data Protection story is a good one to tell. It's time to get re-acquainted. Join us for the first in a series of sessions that will open your eyes to new opportunities with HP Data Protection. CIO and CTO executives from RTT, South Africa’s largest privately-owned supply chain services and distribution company, talk about how they radically transformed their underperforming IT infrastructure with HP ProLiant DL980 G7 systems. A successful proof of concept convinced RTT that an HP server solution running Microsoft SQL Server 2008 R2 would boost system performance and reduce costs. The new HP solution will enable RTT to improve its customized logistics services to clients in niche industries which demand high specialization. IT departments are under constant pressure to decrease time-to-data that drives business decisions and allows quick reaction to new market opportunities. Exponential database growth has led to a performance and availability crisis for business critical applications that cannot be solved with software tuning. The problem is I/O and can be solved only by increased I/O through a combination of more powerful servers and a breakthrough in storage performance. Please join us on this webcast to introduce you to a new, integrated high performance database solution from HP, Violin Memory and Red Hat that solves the I/O issues for business-critical OLTP and BI/DW applications. Mission critical infrastructure is key to the success of your business. HP Converged Infrastructure solutions enable you to meet the most difficult challenges facing IT today head on, while preparing you for the future. Tune in for the latest solutions from HP that will can quickly enhance your data center and your understanding of how HP can prepare you for whatever direction your business is heading.